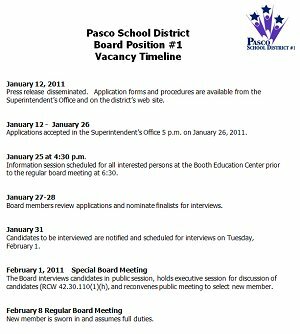 Applications are now available to Pasco School District residents interested in serving the unexpired term of Pasco School Board Director Position No. 1. The new appointee will fill the position previously held by director Pete Felsted whose resignation will be effective Jan. 25. Candidates must be a resident of Pasco School District, a United States citizen, and a registered voter. Applications are available from the Superintendent’s Office at the C.L. Booth Building, 1215 W. Lewis Street and on the district’s website here. Completed applications are due in the Superintendent’s Office by 5 p.m. on Jan. 26. An orientation session for all candidates will be held Jan. 25 at 4:30 p.m. in the Booth Building just prior to the regular board meeting which starts at 6:30 p.m. Information about the roles and responsibilities of school board members is also available through the Washington State School Directors’ Association at www.wssda.org. Current board members will review the applications and nominate finalists for interviews. Interviews will be conducted Feb. 1, during a special board meeting in public session. Board members will go into an executive session after the interviews to discuss the candidates. The board will then reconvene in public session to vote in the new member. The new member will be sworn in at the Feb. 8, regular meeting of the Pasco Board of Directors to assume full duties. Felsted began serving on the Pasco School Board in 2003 after retiring as a Franklin County district court judge. As a Pasco board member Felsted was very active in regional and statewide education organizations that support children, and had previously served as vice president of the Pasco board. Felsted was also a major supporter in the development of Delta High School. For more information contact Executive Assistant to the Superintendent Valerie Smith at 546-2801.